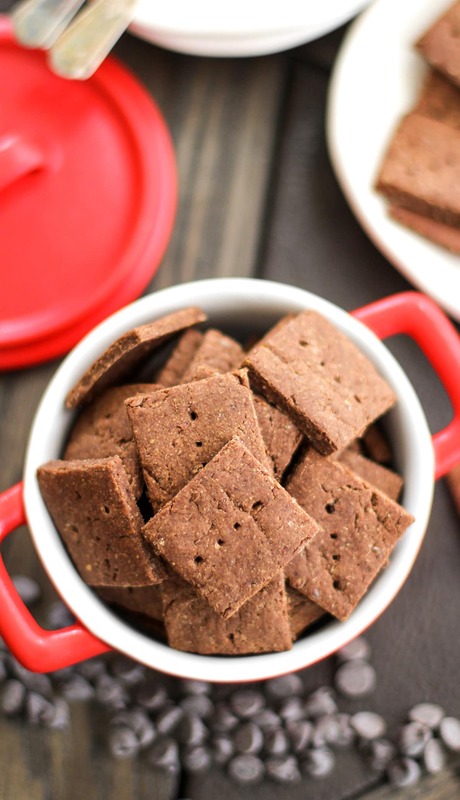 Healthy Chocolate Flax Crackers — crunchy, chocolatey, and slightly sweet crackers that’ll satisfy the snack monster that lives in all of us. 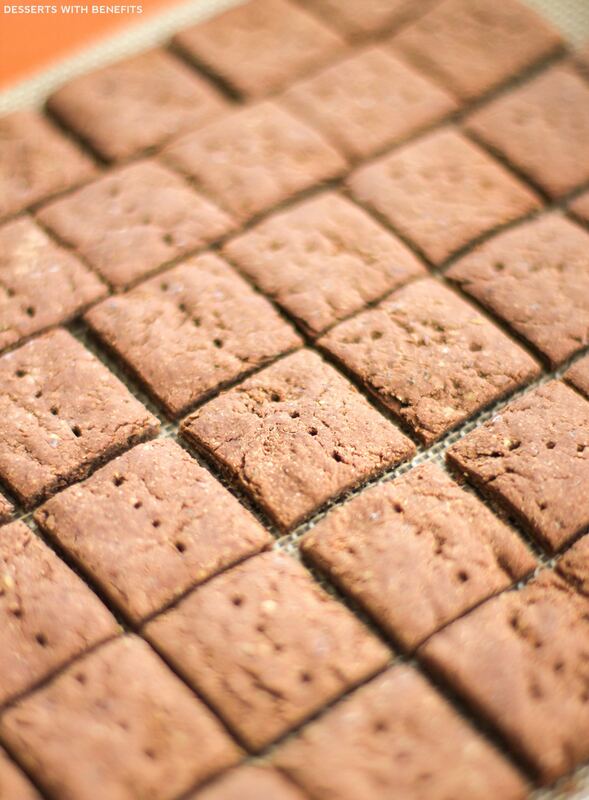 Who needs storebought crackers when you can make these simple 5-ingredient squares of goodness? Storebought crackers are generally never 100% whole grain… they usually cheat and say they’re whole grain, when really they just use a whole grain flour somewhere down the ingredient list. 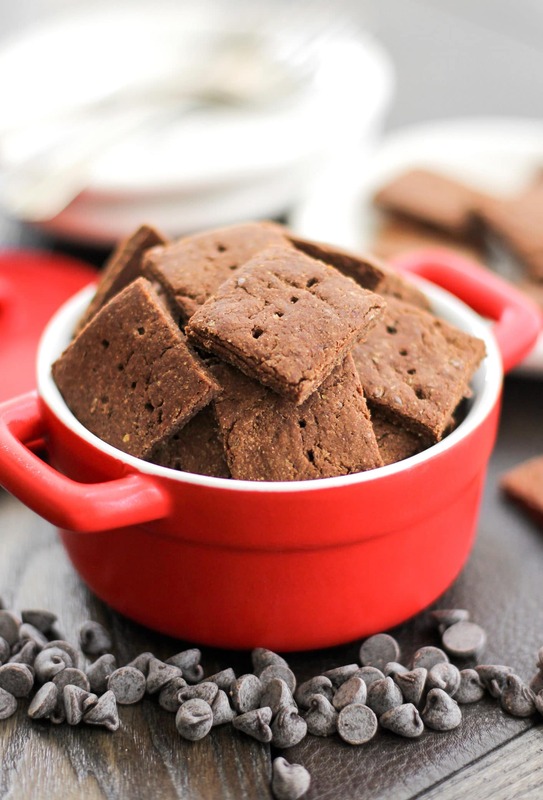 But not these delicious Chocolate Flax Crackers. These are 100% whole grain! They’re firm and crunchy, just a tad bit sweet, and completely addictive. Thank goodness they’re low in sugar, 100% whole grain, gluten free, and vegan. Because that means you can have MOOOOREEEEE. 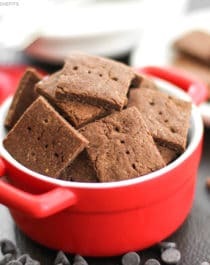 These 5-ingredient Chocolate Flax Crackers are crunchy, chocolatey, and slightly sweet crackers that'll satisfy the snack monster that lives in all of us. Who needs storebought crackers? In a medium-sized bowl, whisk together the oat flour, ground flaxseed, cocoa powder and salt. In a stand mixer bowl with beater attachment, add the water, agave and melted coconut oil. Dump in the dry ingredients and mix on low speed until fully incorporated. Roll the dough in between 2 silicone baking mats until 1⁄8” thick. Remove the top silicone baking mat, and using a pizza cutter or a sharp knife, slice the dough into 1”-thick vertical strips, followed by 1”-thick horizontal strips, to create square crackers. Dock the center of each cracker with a fork. Transfer the silicone baking mat with the dough onto a baking sheet. Bake for 30-35 minutes or until the crackers are firm and crunchy. The crackers will naturally separate from each other along the pre-sliced lines in the oven. Let cool completely on the baking sheet. Recipe from the Healthier Chocolate Treats eCookbook. This fantastic crunchy, chocolatey goodness comes from The Healthier Chocolate Treats Cookbook, the stunning, newly released work of art written by my good blogger friend, Amy, from Amy’s Healthy Baking. 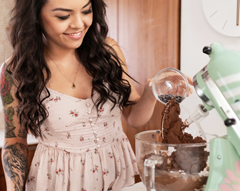 Whether you treat yourself to some chocolate once in a while or whether you eat it on a daily basis, Healthier Chocolate Treats is THE cookbook for you! 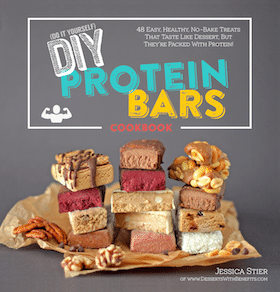 It’s got 50+ recipes with up close and personal photos for every single treat. From white chocolate to semisweet to dark and everything in between, Amy’s recipes are a chocoholic’s dream come true. 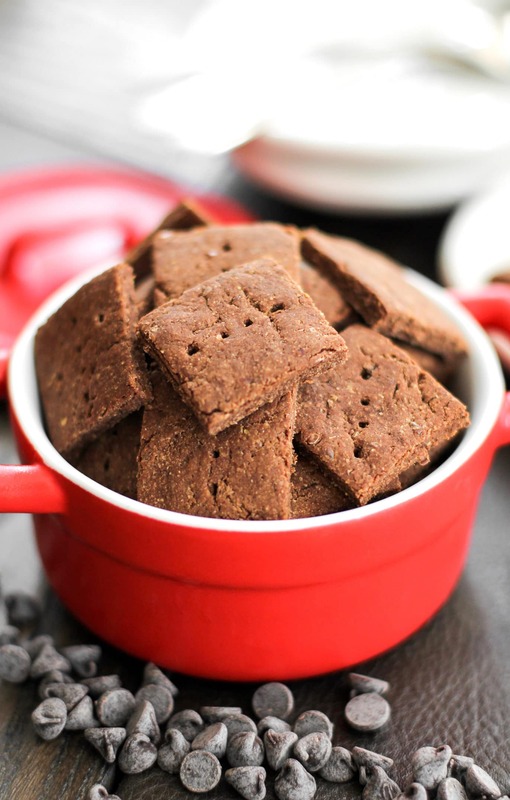 These Healthy Chocolate Flax Crackers are slightly sweet and completely addictive. Kind of like the chocolate graham crackers you can buy from the store, but without all the unhealthy ingredients and excess added sugar. Next stop? The Skinny Double Chocolate Frappuccino! And the Peanut Butter Cup Cheesecake. And the Double Chocolate Zucchini Muffins. My kitchen will be a dessert factory over the next few weeks while I pump out basically every recipe from this cookbook. Thank you for this recipe for a healthy cracker! It is just what I have been trying to find, a healthy one. I don’t have the oat flour, but as soon as I get it, I will be making these. Could you use oats that you whirl in the food processor? Or, just use the whole wheat flour? I have that on hand. Anyway, can’t wait for more of your recipes!! Love healthy eating!!!! Hope you like the crackers!! Just made these!!! Delicious! I didn’t have the flour called for so I used a combination of what I had and it worked…. 1 cup almond flour, 1/2 cup coconut, and 1/4 cup buckwheat. thank you! I haven’t tried subbing the flax here so I cant be sure… these are called “flax crackers” so if you don’t want flax, this recipe probably isn’t for you. 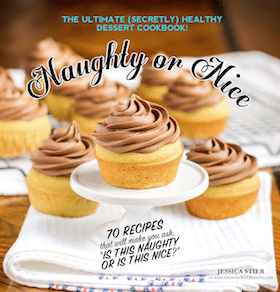 I have another chocolate cracker recipe, but it’s exclusive in my Naughty or Nice Cookbook.